Use of RadioTeletype (RTTY) has received a boost since NASA Marine introduced the Weatherman receiver. But, what is RTTY and why is it useful to sailors? A separate page deals with some reception problems. Marine HF, Amateur Radio, Telephone or INMARSAT? I sometimes get asked "Should I have NAVTEX or the NASA Weatherman?". My usual reply is "Both!" If not Weatherman, then have an HF/SSB receiver, with laptop and decoding software. RTTY is a system for broadcasting text over radio. The technology dates back to the late 1950s and seems somewhat anachronistic. Speeds are slow, even slower than NAVTEX. A similar service is the USCG service, SITOR (Simplex Teletype Over Radio) providing offshore and coastal forecasts over very wide and remote areas from the tropics to the polar regions. There is dedicated equipment to receive RTTY and SITOR but we can receive both using a standard HF/SSB receiver with software packages such as TRUETTY, JVcomm and SEATTY to decode the signals. The main advantage of RTTY/SITOR is the reception of information over an entire ocean area. The USCG also shares frequencies across multiple transmitters according to a schedule, rather like NAVTEX. The system is available over the Atlantic and Pacific including polar regions not served . For more about SITOR see the Monitoring Times link or the USCG site. Around Western Europe and the Mediterranean, the Deutscher Wetterdienst (DWD) , the German Weather Service has accepted the responsibility to broadcast weather information for mariners on RTTY. Frequencies are as in the table below. Some broadcasts are of raw weather observations in a WMO coded form. These are not readily useful to sailors - but see below and the Appendix.. Weather report German North Sea and Baltic Sea coast, Weather situation and forecast valid for 12 hours. Weather report Mediterranean Sea (in German), Weather situation and forecast valid for 24 hours. Around the North Sea and the Baltic this service is a useful supplement to NAVTEX. Particularly so are the 5 day outlooks, These give wind forecast every 12 hours for the 5 day period. The values are straight from the DWD NWP model at a few grid points although these are sufficient to give an overall view and much quicker to receive than synoptic charts on radio fax. In the Mediterranean, most valuable is the 5 day forecast which seems to be used and very highly regarded by the majority of serious cruising yachtsmen. It is a most valuable service for predicting the major strong wind systems such as Mistrals, Libeccios, Tramontanes etc. Such winds are usually well predicted 4 and often 5 days ahead. Conversely, I have never found the 24 hour forecast to be much use. For this period, the French, Spanish and even the Italian NAVTEX broadcasts are to be preferred. The U.S. Coast Guard broadcasts National Weather Service high seas forecasts and storm warnings from four high seas communication stations using SITOR. These broadcasts are prepared co-operatively by the Marine Prediction Center, Tropical Prediction Center and Honolulu Forecast Office. Offshore and coastal forecasts are available in areas such as Alaska. The International Ice Patrol also broadcasts from Boston sharing the same transmitters.. Transmission range is dependent upon operating frequency, time of day and atmospheric conditions and can vary from only short distances to several thousand miles. U.S. Coast Guard SITOR broadcasts are in FEC/SITOR mode B and is also known as Narrow Band Direct Printing (NBDP). SITOR/NBDP is an automated direct printing service similar to NAVTEX, but does not offer all of the same functionality such as avoiding repeated messages. In the U.S., SITOR/NBDP is not approved as an alternative to NAVTEX or SafetyNET for fulfilling the Marine Safety Information (MSI) requirement of ships required to be GMDSS equipped. There are two options. Most blue water sailors are likely to have HF/SSB transceivers. Those, like me, whose passages are mainly not too far from the coast, may not want or need to get involved in marine or HAM HF radio licensing. For us, there are receive only HF/SSB radios. Like most things in this world you get what you pay for and some may prefer top of the range sets. However, I have used the very budget priced NASA HF3 for several years and with great success. Using a laptop, the normal procedure is to connect the radio to the sound card of the laptop and use proprietary software. We bought the SEATTY software for about $US30, and found it excellent. It seems to unscramble messages when reception poor. Alternative packages are available from Mscan Meteo and JVComm32; I have had good reports about both. These are more comprehensive and multi-purpose packages that will also handle radio fax, SITOR and GRIB coded information. Mscan has many more bells and whistles for RTTY than SEATTY and these might be useful for North Sea and Baltic sailors. It may be more appropriate to commercial vessels. But, the best advice is to try the various options and see. In the Med, we did not find a great deal of use for Radio fax so that SEATTY was quite sufficient. A Java based application that will run on many different platforms including PC , Mac, Linux and Android is available to decode RTTY. For deails, start with the SSCA Forum. For links to SEATTY, Mscan and JVcomm, use a search engine such as Google. This is a radio receiver pre-tuned to 4 frequencies - 4583 kHz, 7646 kHz, 10100,8 kHz and 11039 kHz. Simply select which programme is most appropriate for content and reception conditions. These will vary during the day so that reception is not completely automatic. Messages are retained in soft copy and can be scrolled through in the same way as the NASA NAVTEX sets. I have had many good reports of the Weatherman from sailors around western Europe and the Western Med. It should do well in the Eastern Med also. The ability to leave the set running whilst at sea must be a big plus. Laptops are not designed to be bounced around and hate getting wet. I, normally, only use mine when in port or at anchor. Like most marine radios, a good aerial and earth are essential for Weatherman. With my HF3 set, I use the NASA active aerial to good effect. The Weatherman, shown here by courtesy of NASA , illustrates the display from the 5 day forecast of winds at grid points. The points are fairly sparse. Two points are in the English Channel. One is in the bay of Biscay but, rather curiously, this appears near the end of the Mediterranean 5 day forecast! See the example on another page. A slight drawback to the Weatherman is that it will only receive RTTY messages. If Radio fax is required then a separate receiver will be necessary. If space permits, then the ideal solution is to have NAVTEX, Weatherman and an HF/SSB receiver. Another drawback to Weatherman in the Mediterranean is the choice of frequencies. 4583 mHz will be of little use while the 14467 mHz might be useful, particularly in the eastern Med. Weather observations are exchanged internationally using numerical codes consisting of 5 figure groups. These describe all possible weather, wind, visibility, cloud etc etc. Code forms can be found in Admiralty publications. There is software available which can decode the data and plot them onto a background map eg the JVcomm decoded observations shown in the Appendix. In addition, the packages can "analyse" the data and draw isobars. 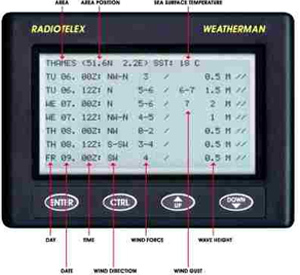 At first sight this should be a useful addition to the yachtsman's weather services. However, in meteorology, as in life, nothing is that simple. The data are "raw" and as received. Errors occur and the software is simply not clever enough to deal with poor data. National weather services running their massive computers put a vast amount of effort into dealing with suspect data using sophisticated and complex quality control methods. To ignore a suspect but correct observation near a developing depression can be as equally disastrous as accepting an erroneous observation. In short if you use such software then concentrate on just looking at the data and be very careful if trying to use analyses. Teleprinter keyboards have only three banks of keys and no lower case letters. If a character shift gets lost then character transpositions occur such as Q, W, E, R, T, Y, U, I, O, P for 1, 2, 3, 4, 5, 6, 7, 8, 9, 0. The decimal point . is on key M, the slash / is on X and the hyphen - is on A. Other possibilities are + (plus) for Z, a : (colon) for C, = (equals) for V, ? (query) for B, , (comma) for N, n ' (apostrophe) for S, a # (hash) for D, a ( (open brackets) for K and a ) (close brackets) for L.
Thus, PMT could be 0.5 (for wave height) and EAR could be 3-4 for wind force. PPZ will be 00Z, QW, where a time might be could be 12. Conversely, a 2 or a 3 where a wind direction might be could be West or East. I download on to my laptop and then try to make sense of such garbling. Messages received in code might look like this for observations received from ships and data buoys. At the start of each message, the four letter/figure groups are ship call signs and the five figure groups beginning 63xxx or 64xxx are indicators for data buoys. Each message is terminated with an = sign. These were received using JVcomm. Wave height: 2.5 m, period: 8 sec. Wave height: 2.0 m, period: 8 sec. Using a bigger dataset (and from a different day) this is an example of a file received by HF/SSB as synoptic type 5 letter groups from Hamburg RTTY and analysed by Digital Atmosphere. The options selected were plots of individual inputs, sea level pressure (mb or hPa) and the wind field. This example was provided by Ross Biddle, skipper of Gemini a (slowly) circumnavigating Australian, a great friend and communications mentor of mine. Ross has corrected (or tried to correct) my many misunderstandings about short wave (HF) communications.